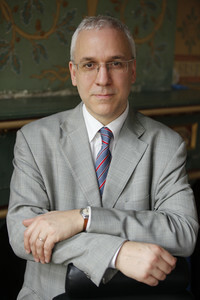 Jan Wouters is full Professor of International Law and International Organizations, Jean Monnet Chair ad personam EU and Global Governance and Director of the Leuven Centre for Global Governance Studies and Institute for International Law at the KU Leuven. As President of the Flemish Foreign Affairs Council, he advises the Flemish Government, and practises law as Of Counsel at Linklaters, Brussels. He studied law and philosophy in Antwerp and Yale University, worked as Référendaire at the European Court of Justice, was a Visiting Researcher at Harvard Law School and obtained his PhD at KU Leuven. He is Editor of the International Encyclopedia of Intergovernmental Organizations and Vice-Director of the Revue belge de droit international. He has published widely (over 500 publications, including 44 books and 85 international journal articles). He advises various international organizations, trains international officials and comments international events in the media.